The world of espionage has changed. Are you ready to enter a world of high stakes, sophistication and deception? Operate in the shadows or be in the heart of the action where the risks are great, but the rewards are greater. Should you accept, you will receive your mission briefing, including; alias, target location and further classified information. In a movie world where how we consume and experience our films is ever changing away from just a single screen in the flickering dark, Secret Cinema has been at the forefront of a 21st Century approach to movie immersion. As physical and live reworkings of classic movies new and old almost takes cinema back to its carnival, playland roots across the globe, it is Secret Cinema leading the charge. And as Bond 25 gears up production for a 2020 release, the secret dossier from Secret Cinema has unveiled their 2019 project will be Bond’s speeding bullet, Casino Royale. Held from June – September 2019 at a location in London yet to be fully revealed, the mission requires precision minded agents, loyal agents and those fully trained to immerse themselves into the dangerously bespoke world of ‘Operation Wild Card’. Should you accept, you will receive your mission briefing, including; alias, target location and further classified information. The time has come to find out if you have what it takes. From recreating a lively psychiatric unit for One Flew Over the Cuckoo’s Nest via the ragtag vagaries and X-Wings of The Empire Strikes Back to the Wes Anderson yesteryear decadence of The Grand Budapest Hotel , the Cold War monochrome of Dr. Strangelove, the pop choruses of Moulin Rouge, the confined walls of The Shawshank Redemption and the grimy industrialised worlds of Alien, the key word is ‘effort’. And this is not just the effort of those mounting these lavish, coyly detailed immersive worlds of often immense scale, planning and infrastructure. This is an effort required of all partaking guests. Slapping on a Star Wars tee shirt or those Krull socks (we’ve all got Krull socks, right?!) is not enough. No way near. Effort is mandatory. As in proper, proper effort. As Secret Cinema no doubt dust off their gambling chips, green baize and Aston Martin bonnets to prepare and operate a lavish and intricate Triple X-perience for all Bond fan visitors, the onus is equally on those attending. Detailed instructions have to be understood, dress codes have to be followed, locations become characters themselves, rules must be obeyed and secrecy is paramount. The 2014 Back to the Future event ignited not just the DeLorean’s flux capacitor, but the attentions of the world’s movie press, fans and creatives. 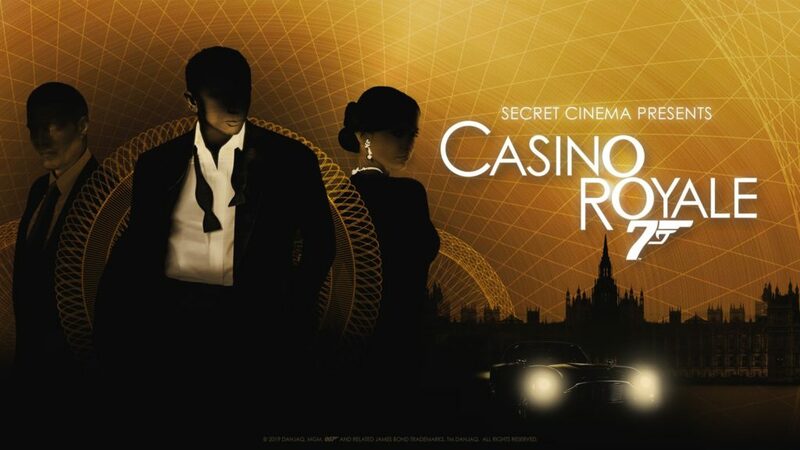 If all goes to plan, Secret Cinema‘s Casino Royale promises to be a world class venture full of creative shenanigans, double-agent glamour and dangerous shadows. Launched in 2007 by Fabien Riggall as the boom for physical creativity, live performance spaces and vibrant – sometimes provocative – cabaret has flourished, Secret Cinema has taken the world of immersive cinema – and immersive art – by storm. 360-degree, 100% participatory and curtain free performances are the mantra of their secret movie-scapes. In a world where access to everything – our news, our stories, our films – is instant and often lacking grace, Secret Cinema wants to remind of the physical fluidity of cinema, how we have always been part of it (even sitting in a darkened theatre), how art needs to reach as much as be made in the first place and how cinema gets into our very souls. Step forward Daniel Craig and his first 007 bullet, Casino Royale. Designers, actors, physical performers, artists, set builders, musicians, costumiers, lighting wizards and all bring their love of storytelling to Secret Cinema. Casino Royale will be more than just some office party Bond display in the Odeon foyer, audience members clutching a toy white cat from Primark, cruise ship evening glamour and a 1999 Best of Bond CD from the Eastbourne Philharmonic. Secret Cinema is about worlds, mindscapes, interactions between performer and audience and what beats of a film have seared onto our minds so much. This presentation of Casino Royale will be about rolling the dice on a whole franchise, repurposing the drama and beats of Craig’s 2006 debut and finding the contemporary tone of Bond. This bullet catcher doubts very much if this will be a safari-suit medley and golden girl bikini parade. This will be a celebration, a quest, a mystery, a contemporary dive into the mind of 007, and creative awareness of the tone, timbre and palette of Bond and Casino Royale as 007’s newest bullet loads into production in 2019. In a secret location, Secret Cinema will open up the doors to the iconic world of James Bond, brought to life beyond any film-lover’s imagination. PLEASE NOTE: Due to phenomenal demand more tickets are being made available. Lavish nights require lavish lies. As one of the finest at Hotel Splendide you’ll soon find out that the darkest of secrets don’t always hide in the shadows. 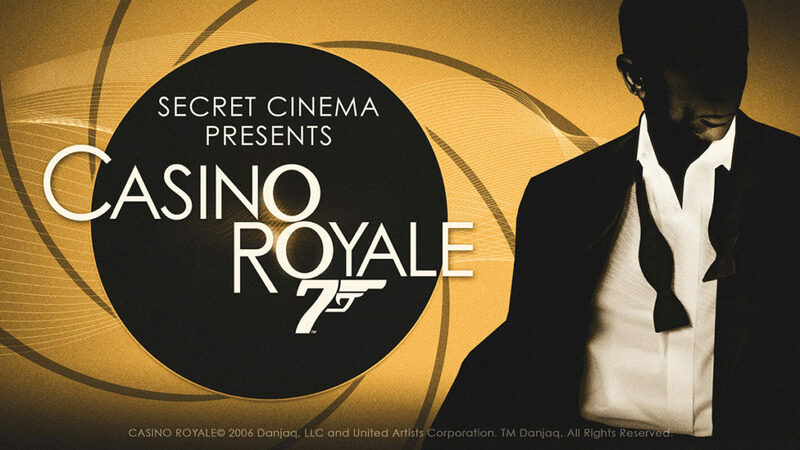 Tickets for Secret Cinema Presents CASINO ROYALE will be available from Dec 6 2018 from Secret Cinema’s website. For more details on Secret Cinema, click here.